The EGO compressor was designed to be an homage to the things that people love about classic compressors, but adding modern amenities for complete tone tweakability. To break it down simply, a compressor will make loud noises quieter and quiet noises louder. When playing really fast, it keeps everything consistent in volume and smooth sounding. A compressor will keep the volume from spiking if you accidentally pick too hard, but it also makes the note ring out longer by raising the sound of the note to match the volume threshold that you have set instead of letting it fade away quickly. It helps to keep your output consistent, but often sacrificing the dynamics of pick attack. A classic compressor like the Ross or Dyna Comp (which is what the Ego Compressor is based on) had 2 knobs that were Output/Level and overall compression (called Sustain) and that was it. We tried to give the player as much flexibility as possible by adding the Tone, Blend, and Attack knobs, along with the typical Level and Sustain. Our favorite part of the Ego compressor is the blend knob. This was a newer thing when the Ego first came out, and it allows the ability to fine tune exactly how much compression the player desires without losing any dynamics and character of your regular clean tone. The blend also helps it fulfill different roles depending on what is trying to be achieved. 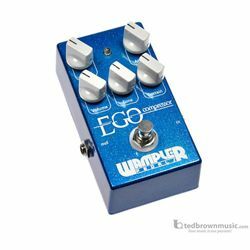 It can be used on the less effect-driven side as an always on pedal to just add a bit of sustain and punch to the notes, but still retaining picking dynamics. It can also be much more of a noticeable effect, setting the sustain high and the attack quick to get what’s referred to as “Pop and Squish” for country and funk (among other genres).